Past Shows - INTERNATIONAL COCKSHUTT CLUB INC.
at the Marion County Steam & Gas Engine Show was not actually considered a "club show", by the executive. and Canada, headed by Bob and Anna May Schwaderer, were extremely pleased to find that there were so many Cockshutt tractors still around. Arrangements were made to meet in Port Columbus, Ohio on November 11 of that year to form an International Cockshutt Club. It was in reality the first actual ICCI Membership Meeting that was held at the 1990 Marion Show with plans being made for the first annual ICCI show to be held in Brigden, Ontario the following year. May 26-28, 2006, Buckeye Farm Antiques Inc.
An impressive 205 feature tractors surrounding the Cockshutt building. Great weather for a busy show which included two auction sales! August 19-21, 2005, Bruce County Heritage Assoc. "70 years of Cockshutt 70's" was the theme of this event. Although damp at times, a little rain could not keep ICCI members from enjoying this great show and the working demonstrations. a signed copy of Bill Cockshutt's new book entitled "About Cockshutt". ICCI members from over 12 states, 4 provinces, Scotland, England and Ireland attended the show! In addition to a great display of Cockshutt, they were treated to a special banquet appearance of Gordie Tapp of Hee-Haw fame. August 9-11, 2002, Cumberland Valley C.V. Antique Engine & Machinery Assoc. Cockshutt / Co-op tractors overflowed the "feature" area. What a sight! The new Bob Schwaderer Award Plaque was introduced. Visitors to the Ilderton show were greeted by "Old Ugly" (a rare 1941 Hi-Clearance Row Crop Cockshutt 70) surrounded by 110 Cockshutt tractors, 85 plows and 178 other pieces of equipment. Celebrating the 10th Anniversary of ICCI Shows was the theme at Marion with lots of reminiscing and memories shared. July 16-18, 1999, The Farmersville Exhibition hosted by Lions Club of Athens. 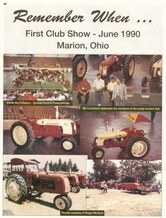 Over 150 tractors and 53 pieces of Cockshutt equipment greeted visitors at the 1999 Annual ICCI show. An additional attraction was Tack's Toy truck collection. ICCI "went west" in 1998 and found heat, humidity and - front and centre - the "Spirit of Cockshutt". August 8 - 10, 1997, Steam & Gas Engine Club Inc.
May 24 - 26, 1996, Buckeye Farm Antiques Inc.
Of the 180 tractors on display, 51 were 30's or E3's in celebration of that model's 50th Anniversary. July 14, 15, 16, 1995, "Great Canadian Field Days"
and over 4000 visitors attended the show. July 2-4, 1993, Sherkston Antique Power Display Show. highest ever. This was one of the early shows in the history of ICCI that made small town shows become known far and wide by many people.